SUNDAY! Gosh what a week. I made hundreds of cookies, booked some future travel, did five days of yoga, took a lot of dog walks, almost put all of my laundry away, and focused very hard on anti-inflammatory meals . In a rare move, I’m going to pat myself on the back and I would encourage you to do the same. I’m sure you tackled this week as dang best you could and honestly? Your best is super great. Well. Done. We’ve reached the middle of March and the start of spring and these days have me re-evaluating the goals I set at the beginning of the year. It’s also time for a little Spring refresh (that will probably focus my bathroom and in the garden) and time for a refocus on a few bigger works projects because day to day email can clog the big dream pipes, ya know? It’s all good, just time to look up and look around. Would you believe that 7 years ago this little book came out? The Joy The Baker Cookbook. Wow it’s very cheap. I think maybe they stopped printing it. The offering this week is below. Some heavy things, lots of talk about beans, and pie. As always, take what you need. • One of my goals this year is to learn how to sew. How many sleeves am I going to futz up before I make anything remotely wearable. Many. Can you sew? Do you have any online recourses you can suggest? After years and years of reading your words and cooking your recipes, it suddenly seemed incredibly lame that I’ve never said hello. Thanks for all of it, and much love. You’re a delight. I highly recommend sewing patterns from smaller pattern designers. They often have great sewalong tutorials on their websites. Cashmerette, Grainline Studio, Colette all have some good beginner-friendly patterns (some even free), You can usually find pictures online of other people’s finished garments which I find really helpful when choosing what will look good on my body type. Have fun! On sewing: use a good pattern and You Tube videos for any terminology you aren’t familiar with. Are you familiar with the Indie pattern company Sew Liberated by Meg McElwee? I just used one of her patterns for the very first time (Arenite Pants!) and it was probably the most well written pattern I’ve ever used. And if you’re looking for good fabric? Stonemountain and Daughter in CA is wonderful. Oh yes…learn to sew. It can take you to so many places…customized things for your home, quilts, personal clothing. Start slow and easy…sleeves might be a stretch but some home decorating project can give you a sense of accomplishment along with creativity. I learned the basics as a young teen and continues to learn to support a desire for ready made clothing my parents would not purchase. So I learned to make things that reflected my style and that were easily affordable. I am interested in reading the article about self made woman. Kaylie Jenner is so NOT a self made “woman” . Have a great first week of spring! I love my sunrise clock. It’s such a gentler way to wake up. Don’t we all need that? Enjoy making so many sleeves wrong – that’s part of the process. Trust me, I’ve sewn all my life and still am never far from a seam ripper. Enjoy! Sewing = Craftsy. Really lifted my game in technique and design. Kentucky would be a pie with apples or pecans not peanut butter. I have a sun rise alarm clock and find it has SO changed my ability to wake up when it’s dark. (A lot up here during the winter!). I hope it helps you too! Sewing! Yes! Check out the Love to Sew podcast. It is brilliant, and you will love Helen and Caroline. They are altogether inspiring in every way. The online sewing community is huge, supportive and inclusive, and there are some amazing indie pattern companies offering lovely and unique things for you to make. The podcast and their show-notes will lead you in the right direction for all things sewing. Can we talk about pie? Because i have spent 1/2 century in Michigan and have never eaten cheeseburger pie. A true Michigander waits for the first week of July when the marvelous tart cherries are finally ready to pick. Then we find the nearest u-pick, with a cherry pitting machine, pick until we’ve filled several buckets, and then go home and make the most fabulous cherry pie you’ve ever eaten. Leftover cherries are frozen in the perfect pie-filling amounts for more fabulous cherry pies. Take a break from the July heat and come visit me. I’ll show you how it’s done. In other news, saying adieu to the ‘hood today. Hope to see y’all around next winter. 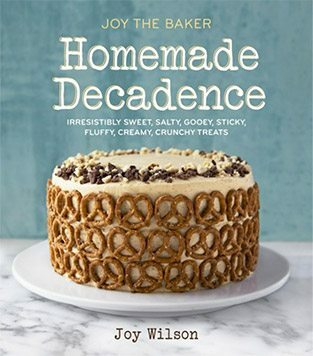 Wow—seven years since The Joy the Baker Cookbook! I came to your book-signing at Brooklyn Kitchen. It was a great event and my copy is well-loved and well-worn. You’ve been a part of many family celebrations, Joy. Thanks for everything! It’s not an online resource but I learned to sew using the Heather Ross book Weekend Sewing. I think you would like some of her projects. Wow, you did really a lot the last week! !Enjoy your Sunday! 57,000 thumbs up for Sister Pie! Dang, that’s a great book. Like yourself, I just started a healthier eating thing/lifestyle? to manage my weirdo perimenopausal/hypothyroid body and live better and longer. But I don’t care what the nutritionists say about sugar.. pie gives joy and pie is staying. Also, if you can’t eat pie, why do you want to torture yourself by living an extra long life? It is so amazing how eating affects the hormones. I am glad you are doing good now!